Where is the one to see who dropped off the roster recently? or something like that? maybe commanders only? There is a report in the Commanders' Corner that shows the individuals who are expiring within 30, 60 and 90 days but it doesn't show the recent expirations. Yea, got access to the 90 days out. Doesn't show those already gone. So.... Who's writing the Help Desk request? I don't think we all need to do it. A simple enough report. Expired members within 90 days with contact information (address, phone and email). Could do a lot to help with retention. The data's available in "CAPWATCH"
When members drop off, their status changes to "EXPIRED". All the contact information is still there too. You can get a report for members whose membership expired within 90 days. The report is under Members Reports, Membership. Make sure you select the option to include inactive members within past 90 days. Now to put it under cadet reports. The data is there, but there's no "reports" per se - those are just raw tables. You still need to be able to do something with them. I forgot about the "90 day expiration" one. these reports are useless for a year if you start tracking something no one was watching before.
. . . Need to read all of the thread. . .
Not really. When their time is done, they're done. I use to chase after expired members and found the best thing was get an "exit interview" and find out why they are leaving. If it is not fun why stay? I would argue that it doesn't belong there. 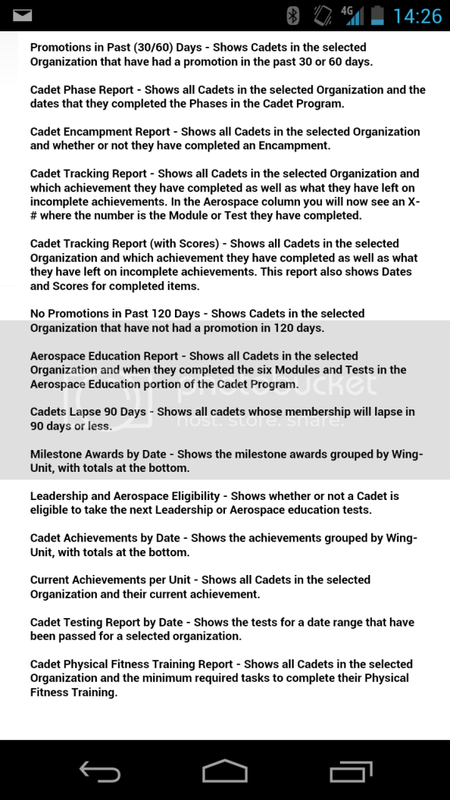 This report isn't just about cadets, it lists all member types at the unit. Right, and as a Leadership Officer, I work under the CDC, who asked me who dropped to bring our count down, and I had a hell of a time finding it out under the cadet restricted apps. So ask your wsa for access to member reports or capwatch download. The purpose of the various cadet centric restricted applications is not to provide the information you were seeking. Incidentally as the Leadership Officer I did have access to the info in the posted report path. But a cadet specific one would be useful, and can be rolled into the 90days from expiration report. Or, you can use SIMS and filter the data you're looking for. Sims? Wasn't that the platform...popular in 2007? I seem to remember there was a lot of excitement about it at the tail end of my cadet days. Of course eservices was also near useless back then and in-house stuff was quite common on the idea front. And where would that report go? How about a section specifically for reports of a membership nature? Say how about in that report option including a function to filter by member type? Something kind of like the attached image. Cadet Promotions have reports. Make it an option under the 90 Day Lapse.